Inspired by the yarn-spinning humor of Mark Twain, Donkey Sense is both a Cinderella story and a slice of harsh reality. In the natural world, we don’t have fairy godmothers or wizards to protect us from bullies. However … WINK … once in a while an animal will emerge to soothe, teach and strengthen us. In Donkey Sense, Pedro, the feisty and magical donkey, provides Timmy with a special friend and a guardian angel who can guide him toward spiritual graduation and happiness. Okay, so here’s the cover, followed by what the back cover might say. “Donkey Sense” by Dean Lombardo, coming this winter. Eleven-year-old Timmy Unterkanz suffers the death of his dad, and then extreme bullying in a new town. Timmy’s in serious trouble – that is, until Pedro steps in. You see, Pedro’s not your ordinary friend and bodyguard. He’s a talking donkey and he’s got a feisty attitude, similar to that of his owner, a former Texas ranch-hand named J.T. Atkins. Pedro and Mr. Atkins teach Timmy the ropes, like how to defend himself when there are no adults around. Timmy also meets Kelly, his eccentric voice of reason and confidence. Timmy’s safety and happiness will come down to one final showdown against his tormentor, the bully Eddie. Can Timmy turn his life around by proving to friend Kelly – and to himself – that he’s not going to withdraw from a sometimes cruel world? That he’s going to be as feisty and stubborn as a donkey. 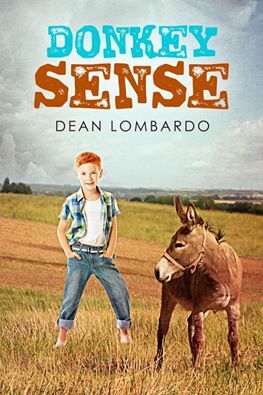 This entry was posted in Uncategorized and tagged Books About Donkeys, Dean Lombardo Children's Book, Donkey Sense Dean Lombardo, Donkey Story, Middle School Fiction by dlombardo2012. Bookmark the permalink.